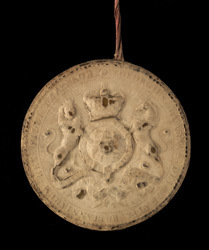 This is the great seal of George IV who reigned as Prince Regent from 1811, and as King from 1820 to- 1830. The seal bears the Royal coat of arms which consists of the Royal shield bordered by a garter on which is written 'HONI SOIT QUI MAL Y PENSE' (Shame to him who thinks ill of it), and this is topped by the Imperial crown. The English lion supports the garter from the left and the Scottish unicorn supports the right. Underneath is a banner which bears the Royal Motto 'DIEU ET MON DROIT' (God and my right). Around the edge of the seal is written 'GEORGIUS QUARTUS DEI GRATIA BRITANNIARUM REX FIDEI DEFENSOR' (George IV, By the Grace of God, King of the British and Defender of the Faith). The seal is attached to the will of Samuel Hall of Tobago.